Mentoring and coaching are both people orientated activities. People offer to do the coaching or mentoring and people receive the mentoring or coaching. Can a mentor be a coach? Can a coach be a mentor? Yes they can, but the tasks and the focus will be different as although both the mentor and the coach plan to improve the lives of the people in their care they will tackle the task differently. These two styles of uplifting people are not necessarily the same. In this part of the statement Green acknowledges the coach and at the same time expresses the kind of encouraging tactics employed by a mentor. Coach and mentor one and the same person but the style of a mentor different to the way a coach would focus on his player. How do these styles of personal development differ? What sets the one apart from the other and what would you choose if you were a potential player in the many games of life offered today? What are the principles of good coaching? Coaching is task orientated. The coach assists with various tasks and skills to improve performance of the individual or team. Coaching is short term. The coach works on specific areas and after a few sessions can review performance and work on another set of skills or reinforce and follow-up. Coaching is performance based. Current skills are improved and new skills added as the performance improves. 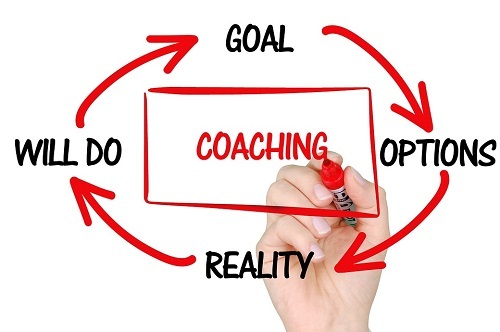 Coaching involves critical input from managers and coachees as the coach gives feedback to the players and managers and everyone is involved in the process as the performance is assessed and skills built on together. Coaching is largely used for companies and sports although it has become part of many life skills too. The coach will focus on specific areas needing improvement or help with implementing new skills and systems. Coaching is especially useful for helping talented members of the team or workforce who are not making the most of their talents. What are the principles of good mentoring? Mentoring is usually based on building relationships and providing a forum where the mentor and mentoree can focus on specific goals to improve performance. Mentoring is a long term development programme. Both parties take some time to build up a relationship built on trust so that the mentoree can share their feelings confidently. 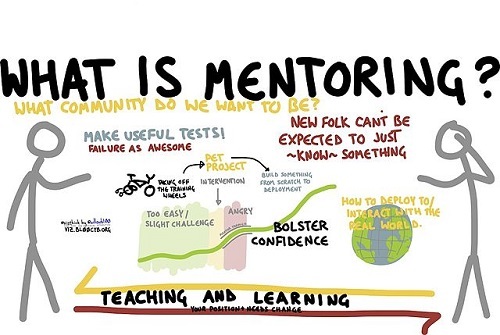 Mentoring is designed to help development and add value to the performance of the mentoree for the present and the future. Mentoring requires a planning phase to decide on the strategy and purpose for the programme within the organisation. The mentoring manager is closely connected to the process of deciding on the programme and skills that will enhance the mentoree but not necessarily involved in the relationship as the mentor and mentoree need to build confidence and confidentiality in one another. Mentoring is used for developing leaders or for specific skills within a company. It builds on internal expertise and keeps professional and personal growth needed to uplift a company. It would be safe to say, after perusing these definitions of mentoring or coaching, that they are separate ideals and describe different relationships and performance building attitudes. However, they do share the common goal of improving performance. They both aim to allow the individual members of the team to achieve their own desires and goals within the team or company. The relationships in the group need to build an atmosphere of trust and mutual respect. They all need to recognise individual and team goals and help build up solid working relationships. Mentors need to be good listeners and have positive attitudes to challenges. They need to have integrity and be good communicators. Mentors need to be encouraging and build up a relationship of mutual trust as they work together offering truthful but encouraging advice. Since mentoring is a longer term project it requires consistent support and wisdom. Mentors are usually experienced more mature leaders in their field. Coaches need the sound communication skills and positive attitudes but they are driven by improving skills and getting the best out of a team member in the short term for the good of the team and that can be a business team or a sporting team. Mentoring has been part of society for centuries. The name has its origins in Greek mythology as Odysseus went away to war and left his son as a baby to grow up under the supervision of Mentor and old and trusted friend. The concept of mentor is about wise and trusted encouragement for helping others to grow in different areas. Mentor is a verb and means the action by which a person is encouraged and assisted in their personal journey. A mentor as a noun is the name given to the person who does the mentoring. The young doctor was able to practice medicine as he was mentored by an experienced surgeon who specialised in heart surgery. The head of department and mentor to the new assistant manager was very encouraging. The word coach can be the noun referring to the coach as a person in the role of teaching and it can also be a verb, the action of coaching. The soccer coach was very involved training his team and running around coaching them with a lot of enthusiasm. The top coaches of the best teams have to earn a lot of respect from teams, fans and management. They have huge responsibilities to deliver results with integrity and honour. Mentoring on the other hand is a more long term connection. Oprah Winfrey was mentored by the well-known author and poet the late Maya Angelou. In the final analysis mentoring would seem more personal and nurturing. The mentor takes the mentoree on a journey of support and encouragement. Coaching on the other hand offers the same promises of growth and fulfilment but the journey travelled to reach those goals is one of more rapid growth in a seemingly competitive environment. A shorter more intense solution to self-improvement and progress for the team or individual. Coaching can be applied to many other aspects of life and is used as a key element in business skills, academics, relationships, life skills, health and wellness and more. When coaching and mentoring come together the individual receives the best of both ideals as super bowl champ Darrell Green testified to during his career as a World class sportsman. A coach that could encourage and activate participation produced the best combination for success. Develops leaders for the future of companies monitoring their performance and personal development in a professional capacity. Develops individuals to use their skills for the good of the team or the company. Also used to introduce new systems. Requires planning and compatibility of mentor for the role of mentoring the mentoree. Requires skills and can be implemented as and when required depending on the skill and the needs of the individual or the team. Mentor is a verb and a noun with coach used as a synonym Coach is a verb and a noun with mentor as a synonym. Mentors need to be encouraging and build up relationships and self confidence Coaches need to earn respect and build up skills to get the best out of the team. Christina Wither. "Difference between Mentoring and Coaching." DifferenceBetween.net. October 17, 2017 < http://www.differencebetween.net/miscellaneous/difference-between-mentoring-and-coaching/ >.